Find birthday cake ideas, examples, recipes and pictures of our most recent cake creations. Lauren of Fuquay Varina, NC ordered this 13th birthday cake designed special for her daughter. 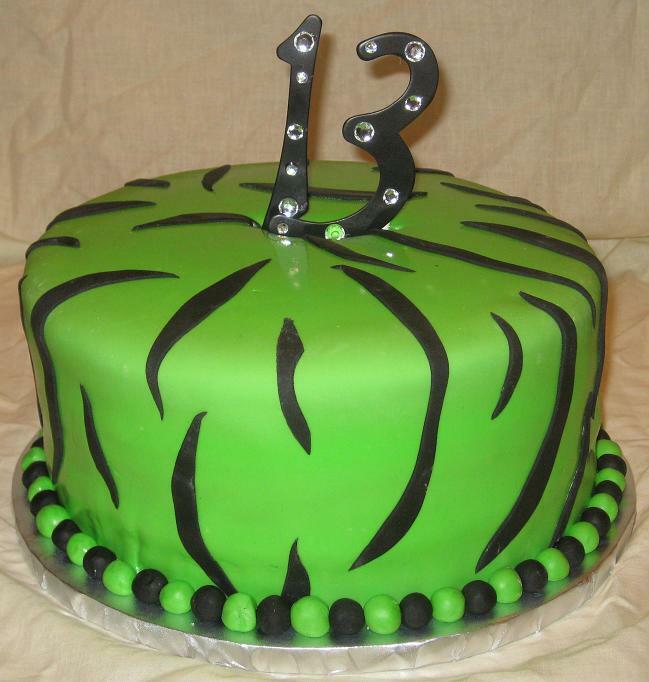 The cake was emerald green with zebra stripes and a bedazzled 13 as the topper. The birthday cake flavor was vanilla with buttercream covered with our hand made marshmallow fondant. 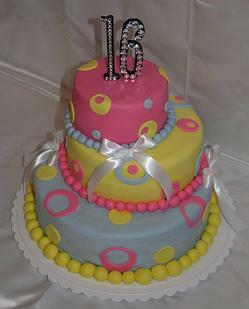 This crazy cakes idea was designed and ordered by a loving sister of the birthday girl to celebrate her 18th birthday. These unique cakes were as fun to make, as they were to eat. We get all of the "cake-making" leftovers! E-mail Steph about your birthday cake ideas! At Piece A Cake we try to create a unique cake that matches the theme of the party and the personality of who the cake is for. 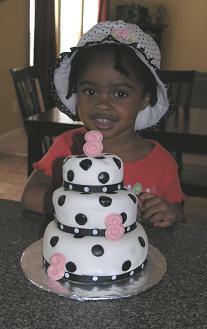 This birthday hat cake was special ordered by a special father, Brian K. for his beautiful daughter. He drew up a sketch of what his daughter wanted her cake to look like on her 11th “Crazy Hat” birthday party. The hat is an exact replica of the hat she was wearing to her party. One layer and hat was made out of chocolate cake with chocolate butter cream icing and the middle layer was vanilla cake with butter cream icing. 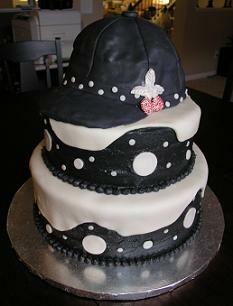 The hat cake is covered in marshmallow fondant and the cake layers were covered with butter cream with accents of white fondant. What a great birthday cake idea! 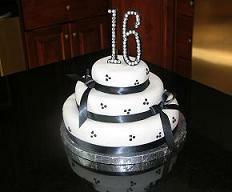 This cake was made for Taylor who was celebrating her 16th birthday. Her loving father Michael, who wanted his daughter to have a special sweet 16 birthday cake unique, planned the surprise birthday party. 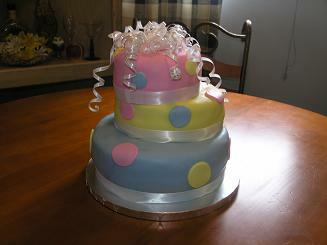 The cake was chocolate, yellow, and almond flavors with butter-cream icing covered with colored marshmallow fondant. Feel free to Forward This Page to a friend. Thank you for helping us grow! “Steph, I can't thank you enough! 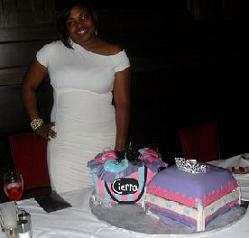 I was very impressed with my princess 25th birthday cakes and I truly enjoyed myself. My princess cake theme has been the talk of the town and I look forward to planning my next event. We’ve been eating cake for breakfast; lunch, and dinner LOL…it was absolutely delicious. I really appreciate all of your hard work that you put forth in making my 25th birthday party a success. Again thank you and you will be hearing from me soon.” Cierra J. - Wilson NC. 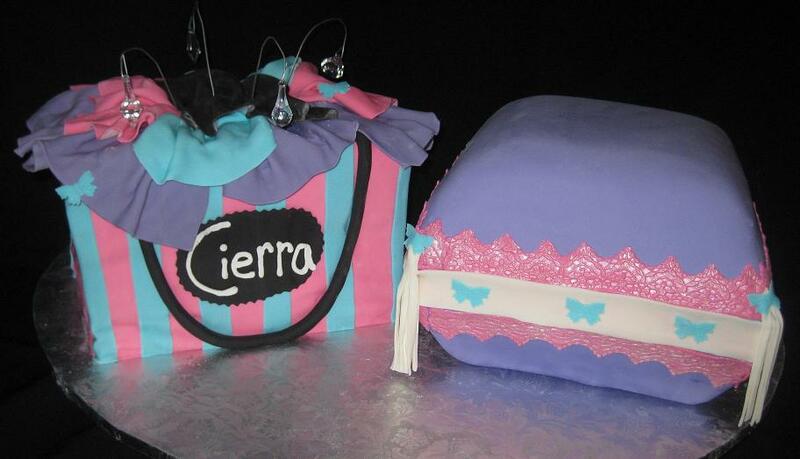 This 25th birthday cake idea was custom made for Cierra from Wilson, NC. She was celebrating her 25th birthday at Ruth’s Chris Steak House. The shopping bag was chocolate with buttercream filling and the pillow was white cake with buttercream icing. 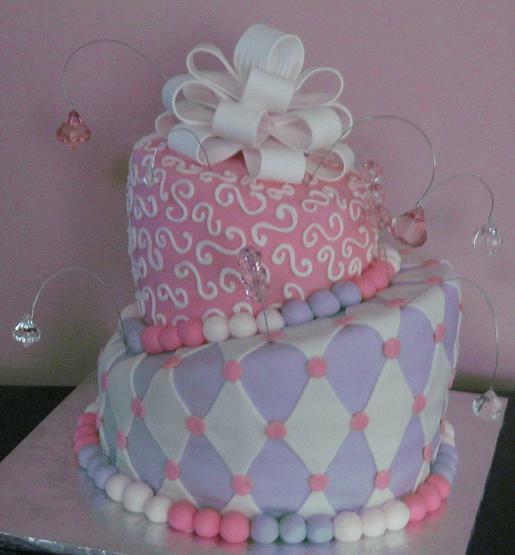 Both cakes were covered and decorated with marshmallow fondant. Prices will vary depending on the size cake and the decorating. We strive to offer the best pricing, service and cake products in the area. So, you are going to throw a party, but not just any kind of party...a rockin teen party! 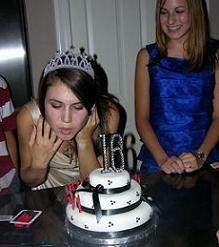 Visit rockin-teen-parties.com for some great party ideas. This Carolina Blue Topsy birthday cake idea was custom designed for Tim by LaKrystal. Happy Birthday TIM! Topsy cakes look out of this world and are fun to make! This TOPSY I made for my sister’s 23rd birthday cake. She was celebrating it with lots of close friends at a local restaurant. She wanted it to have that uneven look, so that’s what she got! The bottom tier was chocolate with cream cheese icing. The second tier is French vanilla with cream cheese icing and I can’t remember what the 3rd tier was, LOL! Sorry Sis. I covered them all in our special fondant and with the leftover fondant I cut out different size circles for each cake and placed them on by using water that acts as glue. I assembled them by staggering them, and placed a dowel rod all the way through the tiers to stabilize them. 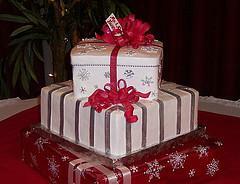 I then added ribbon around each tier and placed a store-bought gift ribbon on top. She was very pleased and everyone at the party commented favorably. 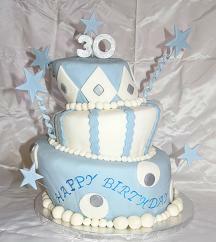 This 30th birthday cake idea was ordered by A very nice lady, Kelly. 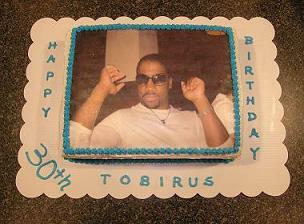 Tobirus was celebrating his 30th birthday and the picture was from his previous 29th birthday party. I guess this is one way of staying 29 forever! The picture cake was lemon flavor with butter-cream icing topped with an edible picture printed with edible ink! See More Picture Cakes Here! E-mail Steph about your Edible Picture Cake! Visit our Picture Cakes page to see more birthday cake pictures, or should I say edible birthday picture cakes! Visit Cake-Decorating-Corner.Com for unique birthday cake ideas and pictures! 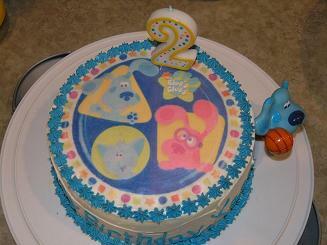 I made this "Blues Clues" birthday cake idea for my youngest son’s 2nd birthday. Fun And Fabulous Birthday Party Ideas - Birthday-Party-Ideas-101 has fantastic party themes for all ages, with numerous ideas for fun costumes, whimsical decorations, ice breaker games, cakes, and much more! It is a basic chocolate cake with cream cheese icing. I picked the blues clues picture off the Internet and printed it out on the edible ink printer. He enjoyed it and to this day is my biggest cake customer! 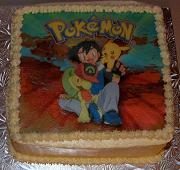 Here he is celebrating his fifth birthday with a Pokemon cake. As he grows each year his interest changes, from cartoons to video games. 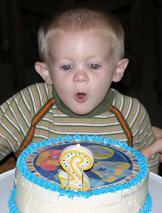 When a child sees their passion on their birthday cake their eyes light up and the joy shines! 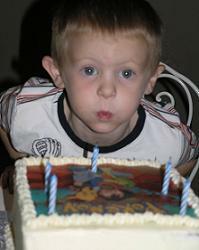 He is still my biggest cake customer and my little angel. Happy Birthday Xander Neal English! Warning! This is not a burrito, it's ALL cake. This birthday cake idea was for a local company employee's birthday party. He just so happened to be a Spanish American and they wanted something with a Mexican theme. 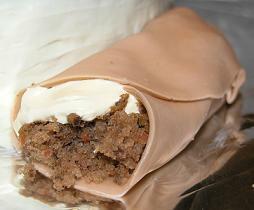 The man loved carrot cake so I made a simple carrot cake fondant burrito with cream cheese icing. I made the wrap with brown colored fondant cut into a circle. I crumbled up the cake, placed it inside the fondant and put a dip of cream cheese icing on top. There you have a burrito look! I placed 10 of them in a Taco Bell bag which they sat on the conference table. Everyone got a few good laughs. This cake is for the chocolate-cherry lover. 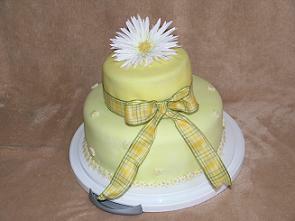 We start out with just a simple yellow cake mix, 2 inches high; tiers are 10”, 8”, & 6”. 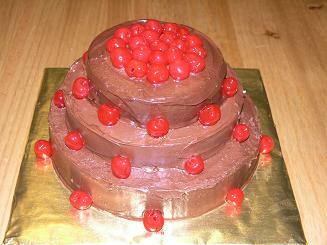 Covered with chocolate icing with cherries for the toppers and arranged around the cakes. 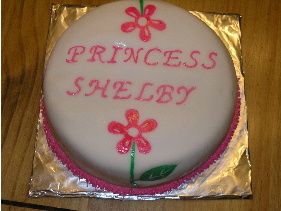 This was a daisy birthday cake that I did on a lovely Saturday. The bottom tier is a 10” butter pecan cake mix with butter-cream icing. Top tier is a 6” vanilla cake mix with cream cheese icing, both tiers were covered with marshmallow fondant, topped with a beautiful faux daisy flower and a nice ribbon around to give it that finished look! It has been commented on and ordered for a birthday coming up in August 2008. 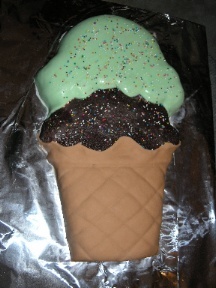 This ice cream cake was my first one when I started making cakes in 2005. You can get the pan from your local craft store. I bought mine at my local A C Moore. It is a simple chocolate cake,the bottom ( cone ) is covered with brown colored fondant. The top is green colored fondant that I brushed water over with a pastry brush and sprinkled with sugar sprinkles. I gave it away to some lovely neighbor. This was my first cake! 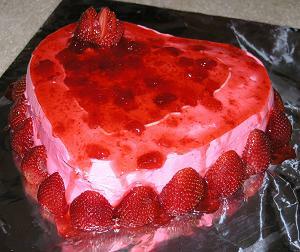 This dripping heart shaped cake is a strawberry flavored cake topped with strawberry cream cheese icing. I used fresh strawberries (cut in halves) to cover the sides and catch the drippings. The top is strawberry filling garnished with a fresh cut strawberry. This candy birthday cake idea was a very fun cake to make and it was just as much fun shopping for the toppings to go on it! This was her 10th birthday and she had a long list of desires for the cake, so we did them all! The top tier is made with Maggie Moos “Better Batter” ice cream. The bottom tier is a chocolate cake with cream cheese icing. 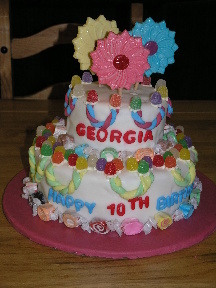 The cake was covered with fondant, decorated with taffy candy, gum drops, and topped with oversized lollipops! This birthday cake idea is a butter-cream delight cake made with butter-cream flavored cake, filling, frosting and fondant. Watch this cake being made! This cake is not for dogs, but for dog lovers...well, I guess the dog could have a little? Woff! Make a dog birthday cake - Get Free Instructions Here. "It's Zari's birthday today and she wanted a lemon cake". Well she wanted to make her a surprise cake. Luckily I had the ingredients for a lemon cake, so my daughter and me whipped up a miniature cake. We made this beautiful little girl her very own cake. 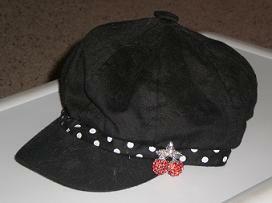 Also my daughter said Zari had been wearing her favorite hat which was white with black dots, so I just so happened had some ribbon that was black with white polka dots. 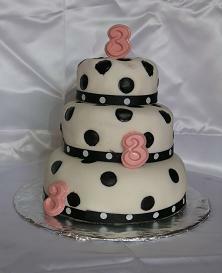 I wrapped that around the bottom of the cakes and put black dots all around the rest of the cakes. I believe this cake was meant to be cause when we arrived at her house her hat matched perfectly even the bottom along with the pink rose on the hat! This birthday cake idea for a 3 tiered tuxedo cheesecake covered in cream cheese icing then wrapped in fondant was custom ordered by a loving mom for a beautiful young lady named Kelcey to celebrate her 16th birthday. What to do with those delicious leftovers? Store cake leftovers fresh for two weeks! Continue to more birthday cake pictures. E-mail Steph about your birthday cake idea. 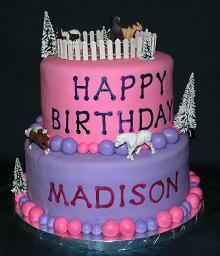 This horse farm birthday cake was made for Jennifer from Garner, NC for her daughter Madison’s 8th birthday. The cake flavors were chocolate cake with butter cream icing and yellow cake with butter cream icing all covered and decorated in marshmallow fondant. Happy Birthday Madison was stamped using edible ink. 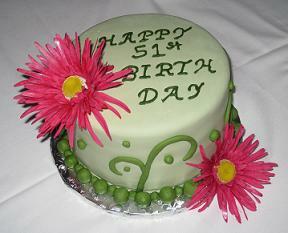 This 51st birthday cake idea ordered by Aimee V. from Raleigh who had also ordered a baptism cake. It was her mother’s 51st birthday the same day as Gabriela’s baptism, so Aimee decided to get Grandma a special cake of her own. The cake flavor was vanilla with butter cream icing and covered in marshmallow fondant and decorated with Gerber daisies. 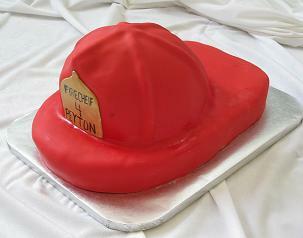 For Peyton’s 4th birthday cake idea he went with the fireman hat cake. He celebrated with friends and family with generations of fire fighters. His mother, Christy from Benson, NC, order his fireman birthday cake flavored chocolate with butter cream icing covered in red marshmallow fondant. Looking for kids party themes, kids party games and party activities, kids party food and kids entertainers. They are all here at Kids-PartyCabin.Com and waiting for you. Forget the stress and strain of where to buy and what to do as we have done that bit for you.